The latest wave of the medium-sized Star Wars: The Clone Wars and Legacy Collection vehicles are on shelves now. HasbroToyShop has them for $19.99 each, but as we recently reported stores like Target have raised their cost to $21.99 each. 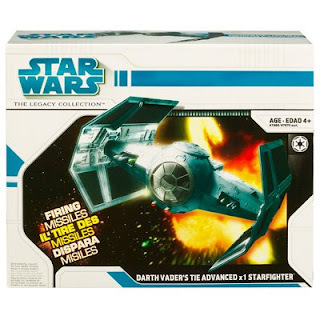 As is the custom for Star Wars lately, most of these are re-issues of past vehicles in new packaging, but Darth Vader's TIE Fighter is always in fashion if you ask me. Plus, the Walmart Exclusive Republic Gunship that we reported on last month has been spotted in a California Walmart yesterday. Retail price for this Gunship variant is $50.